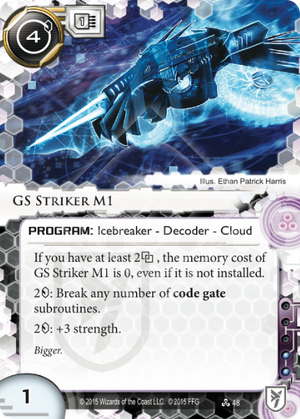 If you have at least 2link, the memory cost of GS Striker M1 is 0, even if it is not installed. 2credit: Break any number of code gate subroutines. Initially when I saw this card my immediate decision was "wow, this card is really bad". It may sound cool that you can just not give a damn about the number of subroutines on an ICE, until you realize that there are like 5 code gates with more than 2 subs. So the 2 to break any number of subs is more often a burden than a blessing. In comparison, GS Shrike M2 is something you might occasionally want to splash into other factions to deal with high strength multisub sentries which are actually somewhat numerous. Likewise, GS Sherman M3 is still an okay in-faction fracter for Sunny. In comparison, Striker just feels god-awful on paper. The two closest comparisons are ZU.13 Key Master and... Peacock. Yeah, that decoder hiding in binders around the world. Zu is more economic for 11 ICE in the game. In 10 of these it beats Striker by exactly 1. The important 2 exception is Turing on a central. Striker beats Zu in breaking 9 of the game's code gates, 6 of which are 1 cheaper and 3 are 2 cheaper. They break even with 18 ICE. Also, remember that Gordian Blade is almost always 1 less to break than Zu and costs the same as Striker to install. In comparison to Peacock, Peacock is more economic for 5 ICE, and always with a difference of 2. The other way around it's 7 ICE, 2 of which make Striker a whopping 4 cheaper. They tie for 26 ICE. Special cases are Ireress, NEXT Bronze and Salvage. Technically Merlin also but I included a 3 sub Merlin in the previous analysis. Ireress is usually not broken as it takes 1 per sub either way. If the corp has 5 bad pub Striker edges ahead and breaks it for 4. Yay? NEXT Bronze varies. Striker break even with Zu at 4 strength and then again at 6, and if finally at an advantage when Bronze hits 7 strength. Salvage is always broken by 2 with Striker, so it breaks even at 2 advancement and after that it's Striker advantage all the way. This might be important if someone actually played Salvage. Which leads us to the crux of the problem: the ICE where Striker has a clear advantage are... Hourglass, Merlin and Orion. So while we're waiting for the Hourglass meta to swing around, Striker mostly shines against Merlin. It also wins both its competitors when breaking Viper, which can actually be useful. The one ICE where it really hurts is the 2 extra to break a central Turing. Enigma, Datapike, Quandary and Tollbooth are also definitely relevant. As far as in-faction goes, Striker is not insanely horrible. Zu does bite off 2 influence, which can easily become 4 since having only 1 in a 50 card deck can be a bit unreliable. Just bear in mind that Zu is almost an econ card's worth cheaper to install. Ultimately, based on the math it's probably playable in Sunny, but you'd better be bringing some serious economy. As mentioned in the Sherman review, bringing Datasuckers can really help reduce the situations where you're effectively paying 2 to boost Striker by 1. Sadly it does nothing to help you when you're breaking single subs for 2. Out of faction... well, unless your meta has some serious Hourglass, Merlin and Salvage shenanigans Zu is pretty much always the better call.